Turkey noodle soup is my go-to soup after Thanksgiving. Don’t let anyone throw away the turkey frame! It will help you make the most delicious soup ever. I promise! 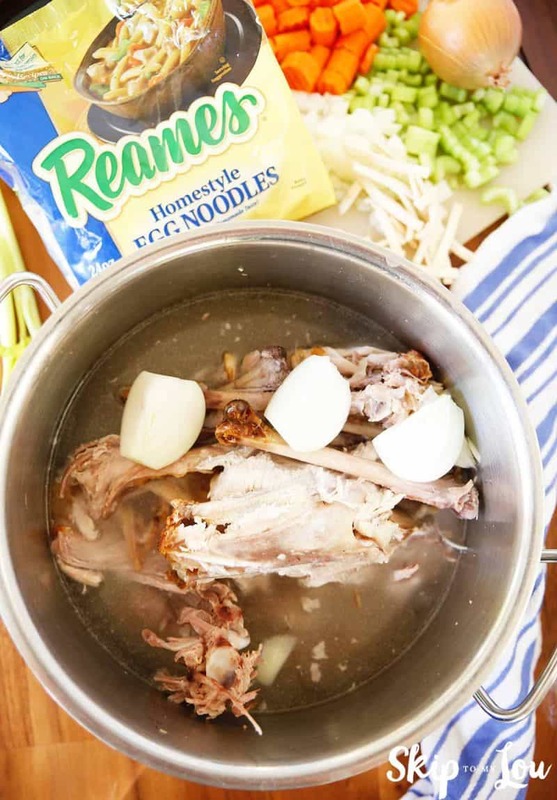 What are the best noodles for turkey soup? 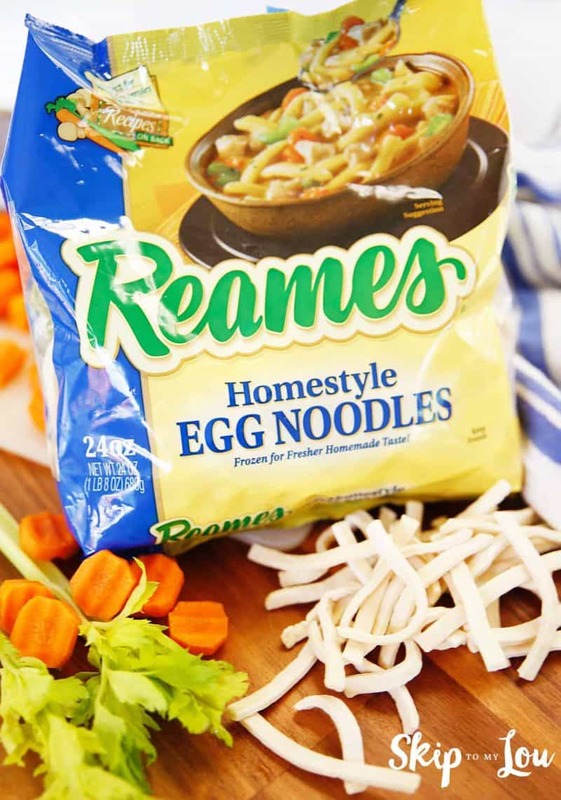 If I am not making homemade noodles I always use Reames Homestyle Egg Noodles. What are homestyle noodles? They are just like you would make at home. You will find them in the freezer section at the grocery store. These noodles taste just like homemade without the trouble. Egg noodles are a hearty, satisfying part of cold weather comfort food for sure! The frozen egg noodles are a heartier, tastier alternative to the thin, dried noodles. 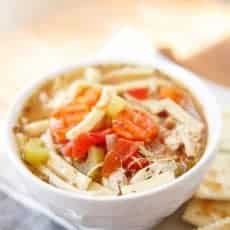 Believe me, they make a huge taste difference in soups and casseroles and are a must in this Turkey Soup recipe. The Reames Frozen Egg Noodles’ are made with 3 simple ingredients: Eggs, Flour, Water—just like how you’d make them from scratch! 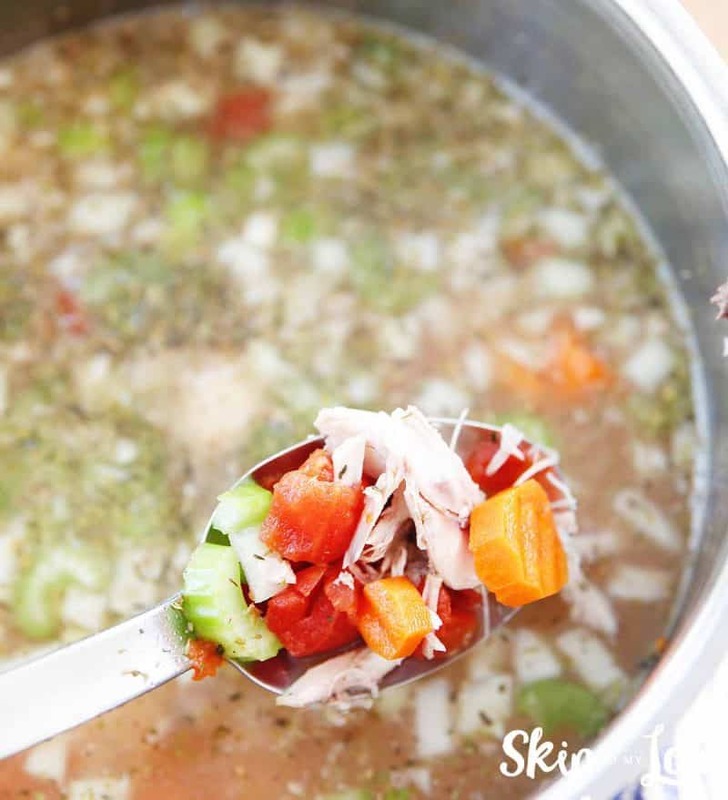 This turkey noodle soup is great to use up leftover turkey and even the turkey carcass! 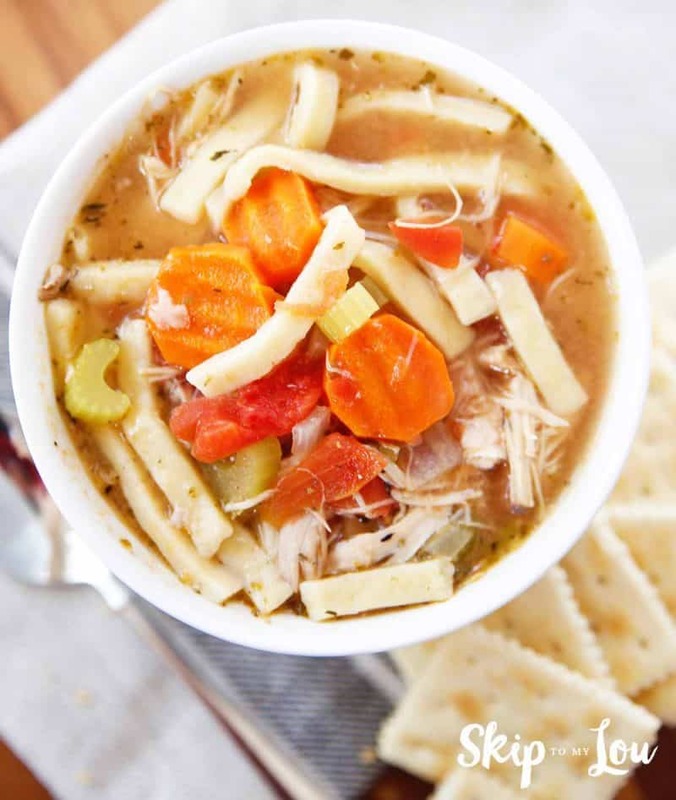 Once the turkey has been cooked and eaten you are ready to make delicious turkey noodle soup! No need to spend time getting all the meat off the bones. The meaty turkey frame will give the soup flavor and meat! Cut the frame in half and put it in a large pot or dutch oven with 3 quarts of water and one onion, quartered. Let it simmer for about an hour and a half. 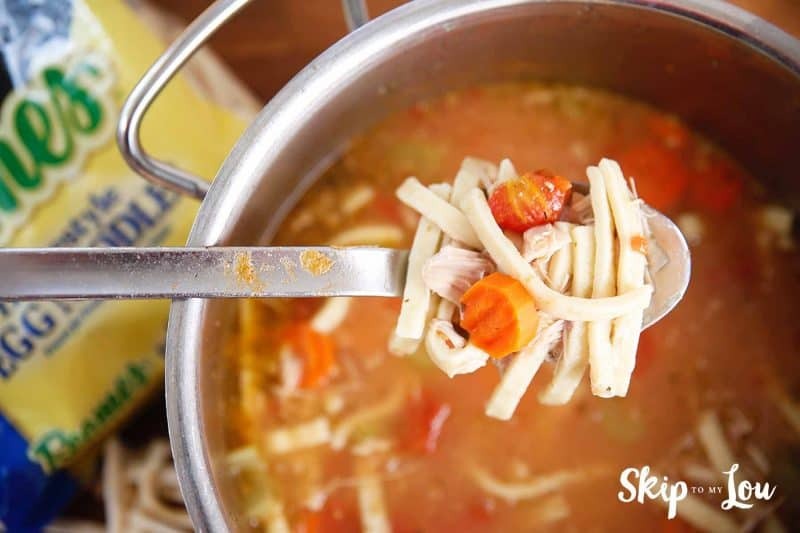 Not only will you have created a nutrient rich bone broth for the base of this turkey noodle soup, but you will also be shocked at how much turkey was left on the bones! Strain the bones from the broth. Place the turkey broth back into the pot. 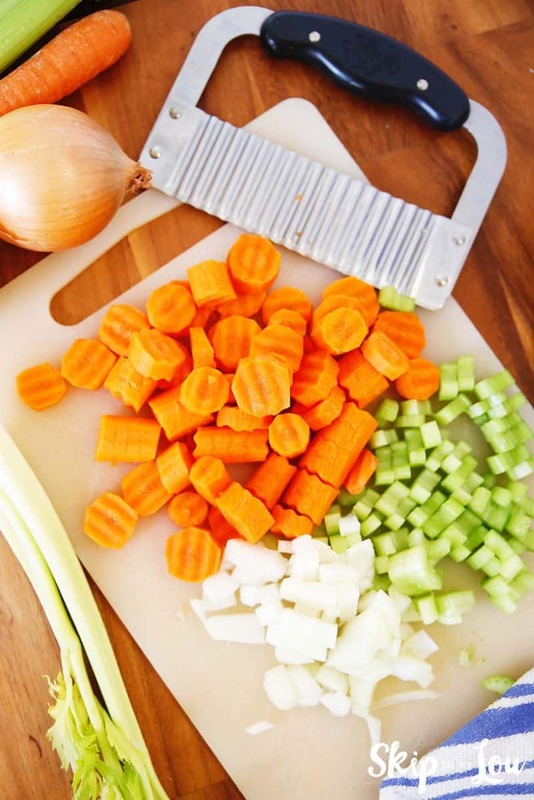 Chop 4 cups of veggies of your choice! Rutabaga, broccoli, and cauliflower are some of my faves. I always use onions carrots and celery. If you like you can cook the onion, celery, carrots in olive oil and butter over medium heat about 5 minutes or until softened and then continue with the recipe. If you don’t have time just throw it all in the pot. It will taste great. This is a very versatile recipe. Place the turkey meat back into the pot along with the veggies, tomatoes, and spices. Bring to a boil and then let simmer about 30 minutes. Put about 3 cups of the egg noodles into the soup. Cook for about 20 minutes until noodles are tender. 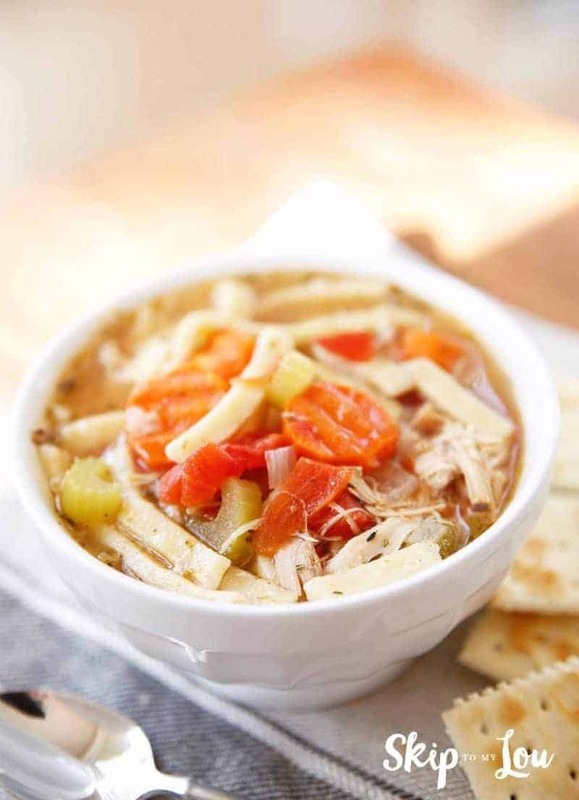 Enjoy this rich satisfying leftover turkey soup! What spices are good in Turkey noodle soup? I like to keep it simple and use thyme, oregano, salt, and pepper. I like to let all the veggies add the real flavor. Cut turkey frame in half. Put in large pot with water, onion and salt. Bring to a boil reduce heat. Cover and simmer 1 1/2 hours. Remove turkey frame, when cool, cut meat from frame. Strain broth. Discard bones. Return broth to pot. Stir in turkey meat, tomatoes into broth. Add oregano, thyme, bouillon granules, and pepper. Stir in fresh vegetables. Simmer for 30 minutes. Add 3 cups noodles and cook for 20 mins. Season with salt and pepper to taste. This homemade turkey noodle soup really is quick and easy to prep and then just let it simmer away. When you are ready to eat season with salt and black pepper. 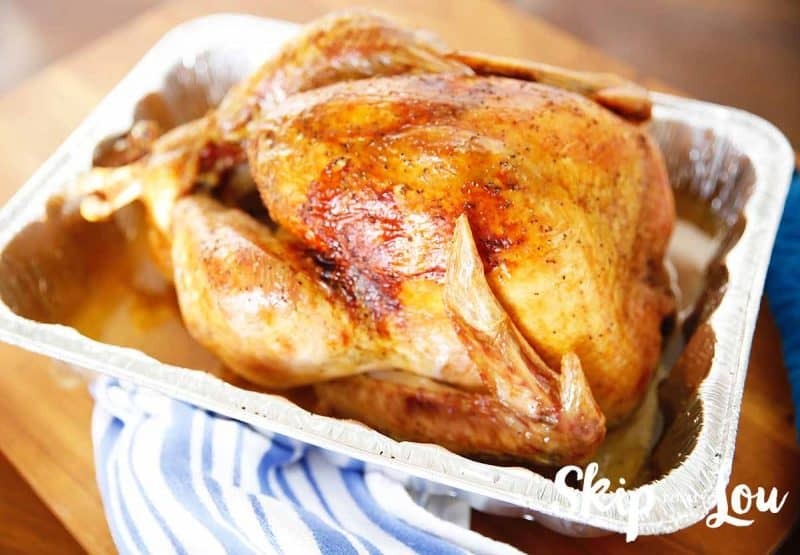 Chicken can be used in place of the turkey to make a delicious chicken soup.